Beer Fellows: Mr. President, may I present to you...Beer Links. It’s Presidents Day which means two things, one, I don’t have to go to work today, and two, mattress sales! George definitely knew about beer. 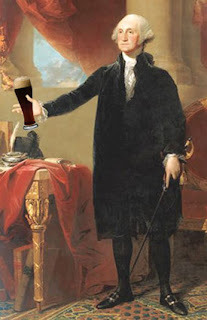 We start of our Presidents Day beer links with a story about Presidents and beer. Seems fitting. And from that mighty summit tumble down into the gutter for beer crime! Go read this article and keep in mind the When Keeping it Real Goes Wrong, Chappelle Show skit. Good ol’ Point, keeping up with the times. I can actually find some of their products out here in northern Virginia now. Not a bad selection of beer in the slide show. Several I will have to track down when I can, particularly the Berliner Weisse out of Tampa. It is a Daily Meal double header, but this is good list for people looking for gluten free beer to enjoy. Our continuing update on the beer situation in Africa. The Bigs are throwing tons of money into that continent to grow those markets to make up for their shortfalls elsewhere. Cool story. Mississippi needs all the quality brew it can get. Politics and beer, they will be forever intertwined. This is pretty step and does seem like a regressive tax, but until I know the numbers I can’t real cut one way or the other. Nice introduction to a cool homebrewing region. Some of these laws regulating beer and wine seem so ridiculous; on top of that they also seem rather hard to roll off the books. Local craft beer is seizing hold of Australia, not that I’m surprised, those guys and gals are pretty thirsty down there. I can only imagine how the beer tastes…we may have to live review it on the beercast…but I can’t fault these guys. This was such an obvious idea that I can’t understand why it didn't happen sooner. This is a big week. Episode 6 of the JGF Beercast will be uploaded tomorrow, we will be looking at 3 Southern Tier stouts this week, expect some beer commentary on Presidents and Lent. Most importantly, Dan, Brett and I will be at Brewvival this Saturday, February 25th! Look for us there if you are going, if not expect some tweeting and untappd madness. As always, you can find us on a variety of forums; facebook, untapped, twitter, and google+, the widget in the top right corner of the page will take you where you want to go. We really appreciate it when you comment. You can also subscribe to the Jolly Good Fellows beercast on iTunes. Please take the time to rate us, it increases our exposure and gets us out to larger audiences.